Top exotic wedding destinations in India - Perfect destinations for Big Day! Top Exotic Wedding Destinations in India – Perfect Destinations for Big Day! When we talk about India, the first thing that comes to our mind is the rich traditions and big fat weddings. There is no doubt that India is amongst the best wedding destinations in the world. With the variegated landscape and the vibrant cultural heritage, India has a lot to offer to all those who want a fancy wedding. We Indians spend a significant amount of our savings on our weddings and make it an extravagant affair. Planning a wedding is a great deal, and the most difficult part is choosing the perfect destination for the big day. If you are planning for your big day and finding it difficult to choose the location, keep your worries to us. We have created a list of the places that can make your wedding a royal affair. If you are fancy a royal wedding with an authentic Rajasthani theme, this is the place for you. Also known as ‘The Blue City’, Jodhpur is a beautiful town in the kingdom of Marwar. Your fantasy of having a fairy-tale wedding will come true here. The picturesque landscape and beautiful forts and palaces make it an ideal location to host your wedding here. The dreamy wedding venues and amazing hospitality will leave your guests delighted and make your wedding ‘an affair to remember’. Jodhpur is one of our top most exotic wedding destinations in India. The Ummaid Bhavan Palace with its breath-taking beauty and wonderful hospitality serve as a perfect destination for your special day. It has also been awarded as the world’s best hotel recently. This palace serves as a permanent residence for the royal family of Jodhpur. The plush green gardens, beautiful fountains, specially themed restaurants, make it a destination like no other. The ballroom ‘Marwar Hall’ and the open sky museum is perfect for the gathering of around 300 people. Other Options: Other than Ummaid palace you have many other options like Balsamand Lake Palace, Fort Chavna Luni, Indana Palace, Ajeet Bhavan Palace, and Taj Hari Mahal. Depending on the kind of wedding you want, you can book the place in advance. Best time: If Jodhpur is your final port of call, make sure you plan it in months of October to March. Rest of the months are unbearably hot. You got to book the places in advance as it can be on the list of many others. Also, reaching here from any part of the country is very easy. It is closeby to all the major cities of India like Ahmedabad, Jaipur, Delhi, etc. Tip: Buy Jodhpuri Poshak and Jutis from the local markets here, if you want a Rajasthani look for your wedding. If you want to skip the traditional set up of Indian weddings and want a beach wedding, what can be better than Goa? With the Portuguese set up, crystal water, clear blue skies, Goa romanticizes your wedding. Having a beach wedding is exciting as well as more fun than the conventional ones. From pre-wedding shoot to the post-wedding ceremonies, everything can be planned at the same place. Have you ever imagined bathing in a sea to get rid of the haldi from your body after the haldi function? Doesn’t it sound interesting? Well, all of this can come true in Goa. Park Hyatt on Cansaulim can be the best pick if you want a luxurious beach wedding. With 200 grand Portuguese villas and huge pools, this place will not fail to amaze you. This resort is at an ideal location with proximity to the airport and many other beaches. The best thing is, it has an in-house wedding planning team that can plan everything for you well in advance. Other Options: Other than Park Hyatt, there are various other options like Taj Holiday Village Resort and Spa, The Leela, The Lalit, etc. Best Time: October to February is the peak season in Goa. You can plan it from September to Mid October if you want to skip rains. If you want a monsoon wedding, you can plan from May to September, as Goa is greenest at that time. The weather here can be unpredictable, so you can expect surprise rains anytime ?. Udaipur is famed as ‘Venice of the East’ due to its architectural magnificence and rich heritage. Situated in Mewar region of Rajasthan, it is surrounded on all four sides by beautiful lakes. 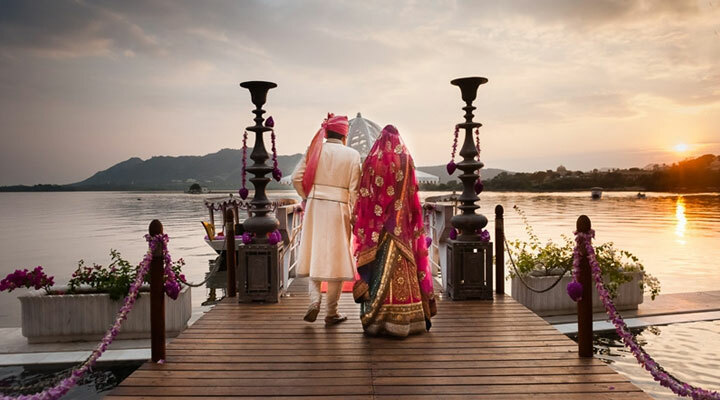 It has many palaces standing splendidly on lakes and hill tops that can host your perfect dream wedding. City Palace is one of the most sought-after places for weddings in Udaipur. The palaces like Zeena Mahal and Manek Chowk can accommodate up to 1000 guests. It is located on the shore of Lake Pichola. It also houses ‘Shivniwas Palace’ which has been declared as the best hotel in India, thrice. Luxurious rooms, extensive courtyards, well-maintained gardens, appetizing food, etc. make it a famous place among the Indians as well as foreigners. Other Options: Hotel Oberoi Udaivilas is also a great option. Do you remember the wedding of Aditi in Jeh Jawani Hai Deewani? Yes, this is that place! It has a grand exterior with decorative domes, beautiful pools, and huge gardens. Chandra Mahal is the hall that can host a small gathering. Among other options, there are places like Taj Lake Palace, Laxmi Niwas Palace, The Leela, etc. Best Time: Udaipur is a hill station and has extreme weather. The best time to plan a wedding there is between September to March. Tip: Udaipur is very famous for the Rajasthani jewelry, you should explore the local markets before the wedding. It is difficult to describe the beauty of ‘The Pink City’. 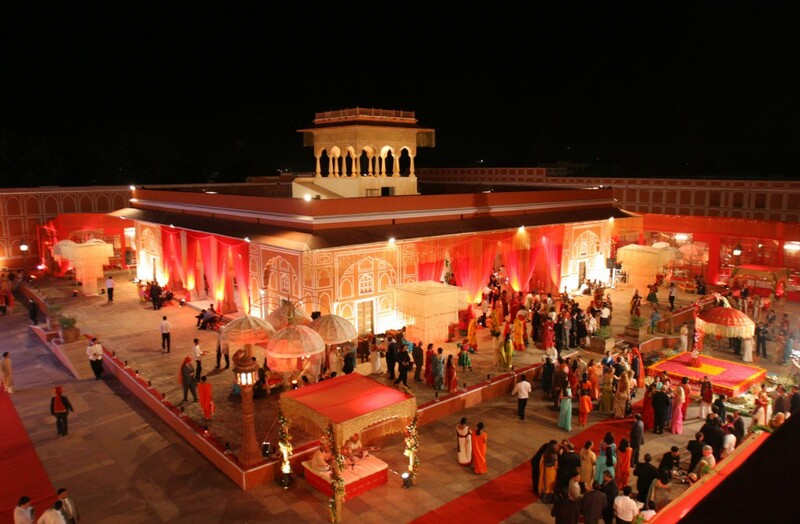 Jaipur serves as an ideal location for your wedding, majorly because of the proximity to Delhi. It is called as pink city because of the plush pink palaces and house. You can get your pre-wedding shoot done here if you want to get the feel of a royal couple. Rambagh Palace is the hot favorite for a destination wedding. The biggest advantage of hosting a wedding in Jaipur is its proximity to the major cities of India like Delhi, Agra, Ahmedabad, Mumbai, Lucknow, Chandigarh, etc. It’s very easy for your relatives to reach Jaipur from almost anywhere. Here, you also have a lot of options for henna artists, traditional entertainers, planners, photographers, etc. Other Options: In the capital city of Rajasthan there are numerous other destinations where you can host your wedding, like Jai Mahal Palace, Samode Palace, and Haveli, Neemrana Fort Palace, Taj Rambagh Palace, etc. Best Time: Best time to plan a wedding here is from October to February. It is one of the hottest places in Rajasthan, so it’s best to avoid months of May, June, and July. Tip: Jaipur is famous for elephant tusk bangles. Don’t forget to buy these bangles to match with your wedding outfit. No matter what venue you choose for your wedding, we wish that you make amazing memories, that you can cherish forever. Roopal Bohra - A book reader and traveler seeking for adventure in everydayness. Working with a private firm as a Marketer.